Happy Holidays! my colleagues yelled. There were two medium size boxes all beautifully gift wrapped. Inside, two old decrepit projectors. I was thrilled. 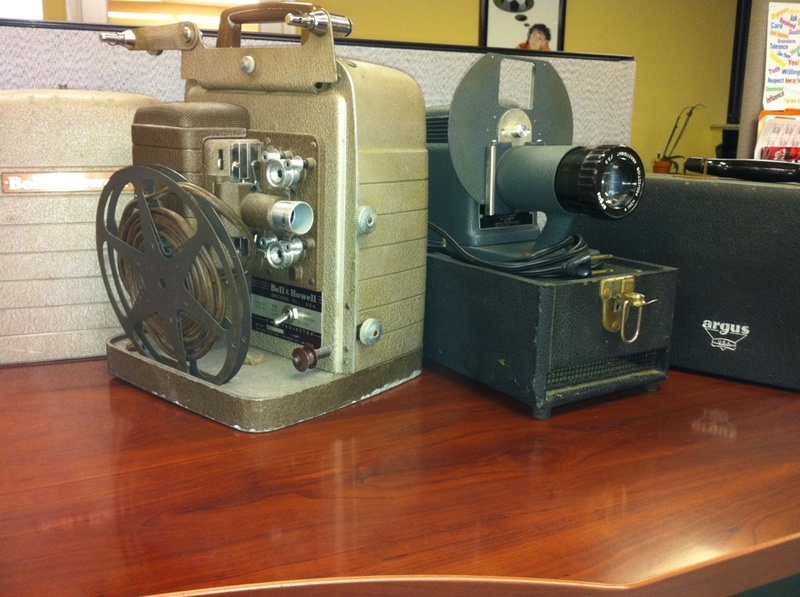 The movie projector is an 8 millimeter Bell & Howell. Model 253A, Serial number H34504. 500 watt lamp, 5 amps, 115 volt AC, 60 cycles. As soon as I get the time, I'll try to look it up and date it (Any volunteers?). The other projector is an Argus slide projector. For those of you who are keeping track, this expands our projector collection considerably. We had previously featured our DeJur and when in California at the STEM conference, I had photographed several old projectors on display at the Claremont. I just realized that we have never truly featured our film strip projectors or our collection of film strips. Stay tuned. My middle school and high school still used these film and slide projectors through my graduation in 2006, but with the new focus on modern technology I'm sure their time has passed by now. Very cool!